My first iteration of The Mirror for Oats Studios "Adam"
At this point I was playing around with ideas for how this blind synthetic human could see into the souls of the robot Traptions. I was given a lot of creative freedom on this Project and It was loads of fun playing around with these ideas. With this version of The Mirror I was playing around with the idea of her having some kind of holographic skin. The idea was that she could project images onto the surface of her skin. She could use this to look totally human or she could change her skin to be completely transparent. 2 variations on the Mirror using the exact same model with different poly paint done in Zbrush. This shows a version of The Mirror and what she would look like under her synthetic skin. With this Version of the mirror Neill wanted to go more human with her appearance so as to later reveal her as a synthetic. 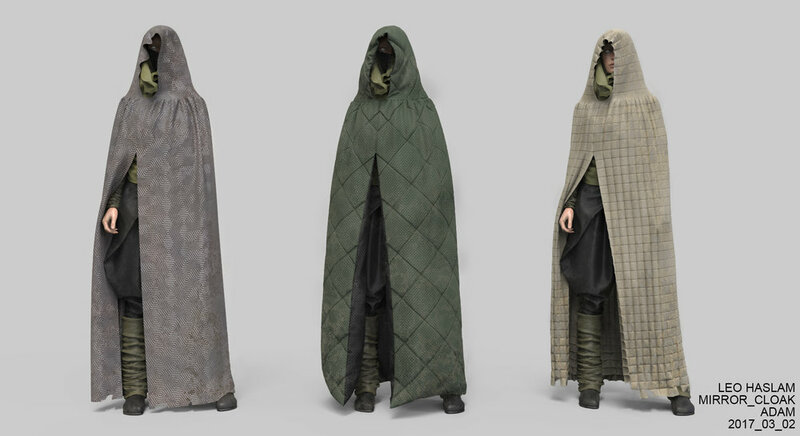 I also had a chance to design some of her robes that she would be dressed in while crossing the harsh wasteland environment. I was asked to experiment with strange/ futuristic materials for the outer cloak. 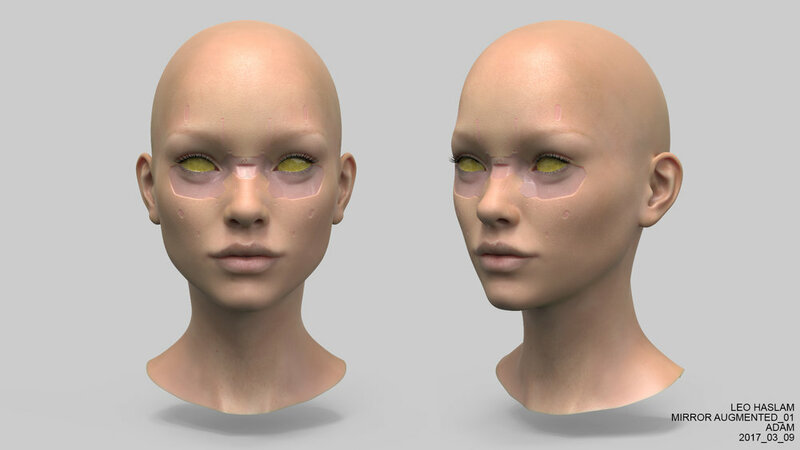 I was asked to play around with the human version of The Mirror, adding some cybernetic enhancements to her head. Hear are some of those iterations. I was also asked to try giving her liquid metal eyes that would behave like a ferrofluid. In the end I was asked to combine the version with the blue jaw and the version with the big grey dome head. This would be the version that made it through to the final film with some added improvements by Ian Spriggs.